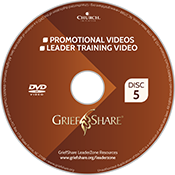 The Leader Training Video is designed to give you an overview of what it takes to run a successful GriefShare ministry. It’s also a great tool for training future GriefShare leaders at your church. The total viewing time is approximately one hour, divided into four parts. Part 1 – What Is GriefShare? The first part discusses the components of a successful GriefShare ministry. It explains the concept of GriefShare as an “emergency room” ministry and talks about what you can do to maximize your ministry’s outreach and impact in the community. Part 2 explores the eight success tips for starting, sustaining, and growing an effective GriefShare ministry in your church and community. Part 3 is designed to equip leaders in ways to effectively lead a GriefShare support group. This segment provides insights on how to create a warm, accepting, and safe environment for participants; how to encourage people to attend and to complete the Bible study homework; and what guidelines are important to establish for your group. We have included a Leader Training Video Outline and Discussion Guide to reproduce for your leadership team when you are using this DVD for training (downloadable online and found in the GriefShare Leader’s Guide). Part 4 helps you get comfortable with leading a group. In it, you’ll learn why you shouldn’t try to “fix” your participants, how to handle participants who won’t talk (or talk too much), how to generate a good discussion, and how to keep from boring your group. If you have overall responsibility for grief recovery ministry in your church or if you are the person who is starting a new grief recovery ministry, use this video to help you formulate a strategy and foundation for your ministry.